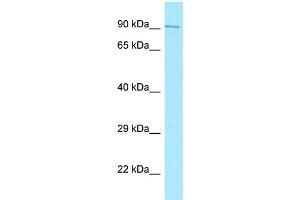 Characteristics This is a rabbit polyclonal antibody against JMY. It was validated on Western Blot. Background JMY acts both as a nuclear p53/TP53-cofactor and a cytoplasmic regulator of actin dynamics depending on conditions. In nucleus, JMY acts as a cofactor that increases p53/TP53 response via its interaction with p300/EP300. JMY increases p53/TP53-dependent transcription and apoptosis, suggesting an important role in p53/TP53 stress response such as DNA damage. In cytoplasm, JMY acts as a nucleation-promoting factor for both branched and unbranched actin filaments. JMY activates the Arp2/3 complex to induce branched actin filament networks. JMY also catalyzes actin polymerization in the absence of Arp2/3, creating unbranched filaments. JMY contributes to cell motility by controlling actin dynamics. JMY may promote the rapid formation of a branched actin network by first nucleating new mother filaments and then activating Arp2/3 to branch off these filaments. The p53/TP53-cofactor and actin activator activities are regulated via its subcellular location.